From restaurants to high tech manufacturing, demand for a qualified workforce is high as the Seacoast experiences unprecedented growth. Come learn how the state's educational institutions and business community are working together to meet the need. A deeper dive into training, technical and program assistance, and support for your business. Circulate amount workforce development experts to acquire "Outside the Box Thinking" to help develop your labor pool. 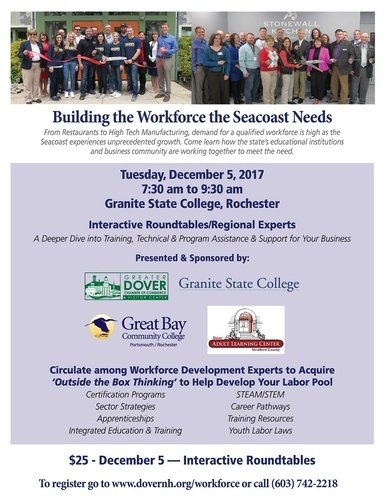 Roundtables will include: Certificate Programs, Sector Strategies, Apprenticeships, Integrated Education & Training, STEAM/STEM, Career Pathways, Training Resources, and Youth Labor Laws.